The hotel I’m staying at apparently prevents me from uploading images for BPotD because of some sort of file size restriction, so I’ll have to find another venue for the rest of the week. In the meantime, I did have this entry I started to write last year until a question came up that has so far proven unanswerable, so I’ll share it instead. 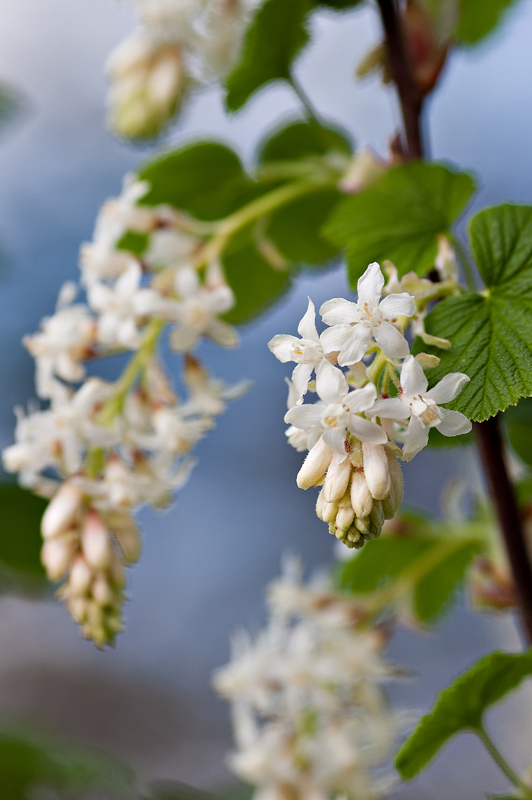 The cultivar name ‘White Icicle’ for this flowering currant was published in 1986 in HortScience 21(3):362, by Dr. Gerald Straley of UBC Botanical Garden (deceased 1997). Commercially introduced in 1988 as part of UBC Botanical Garden’s plant introduction program of the time, it was a variant that had originally been selected in 1973 from Vancouver Island. Compared to other white-flowered cultivars, it is generally considered more desirable as it has pure-white flowers and it is a more vigorous plant overall. While visiting some public gardens in Washington and Oregon this past week, I’ve spotted it planted prominently near the entrances. It is, at least regionally, indeed deserving of being one of the Great Plant Picks. The question I’ve yet to answer is why the Royal Horticultural Society’s Plantfinder (which we use as our initial reference for cultivar names in UBC Botanical Garden) lists the cultivar as Ribes sanguineum ‘Ubric’, and instead notes that White Icicle is a trademark (or a commercial designation with financial rights and responsibilities). I’ve searched the US, UK and Canadian trademark databases, and came up with zero results for the combination “white AND icicle”. I also don’t believe the Botanical Garden ever registered trademarks for any of its introductions, though more digging in the archives may prove me wrong. Thank you for sharing the info on this beautiful plant. I especially enjoy the close-up photo along with the overall photo of a large plant specimen. This is so ideal. I would appreciate more double images in the future. What a lovely flower with an even lovelier name, Adesmia? Parents looking for baby names…. Will this grow in New York? According to information that I a received early in 2002, ‘White Icicle’ was a plant that a Victoria, BC-area plant enthusiast had given to Jim MacPhail in 1973. Jim was curator of the E.H. Lohbrunner Alpine Garden here at UBC Botanical Garden. The unnamed plant enthusiast could have been nurseryman Ed Lohbrunner himself, who supplied the Botanical Garden with literally thousands of plants for its developing alpine and woodland gardens, but it’s equally likely that it was someone else in Jim’s vast network. The value of the cultivar is in its larger flowers and inflorescences and early flowering. It generally blooms at least two weeks prior to any other cultivar. Doug I acquired it many moons ago, can’t remember where. UBC Botanical Garden shop does not seem to know this plant. Pure white flowers seem to have a magical quality. I have pure white camellias and they are breathtaking. I remember that the Sissinghurst garden in England had a “white garden”. A mass of white flowers seems to glow in the dusk. I wonder if this flower has a fragrance? What a gorgeous plant. I love living in Hawaii but do miss the diversity of plants found in the parts of the world that have the 4 seasons. Thank you for all the wonderful photos and the well researched information. With all the knowledge I have gained over the last couple of years I almost feel like I could have a degree in Botany. Mahalo for all your hard work! In which case above references to ‘White Icicle’ should be replaced with ‘Ubric’, White Icicle being a trademark and not a plant. Posting the correct combination here may help others pick up on it. thank readers for all the information and what is your pollen count! Thanks Pat and Ron. I’ll look into the archives when I get back to the Garden next week and see if I can find the application to COPF. Unfortunately, the people who would know offhand about this have either long since retired or passed away. Agreed, Ron, re: clarifying the name. Does that mean I can’t buy it? There is a particularly fine image of ‘White Icicle’ gracing the cover of the January 2012 issue of Pacific Horticulture magazine. 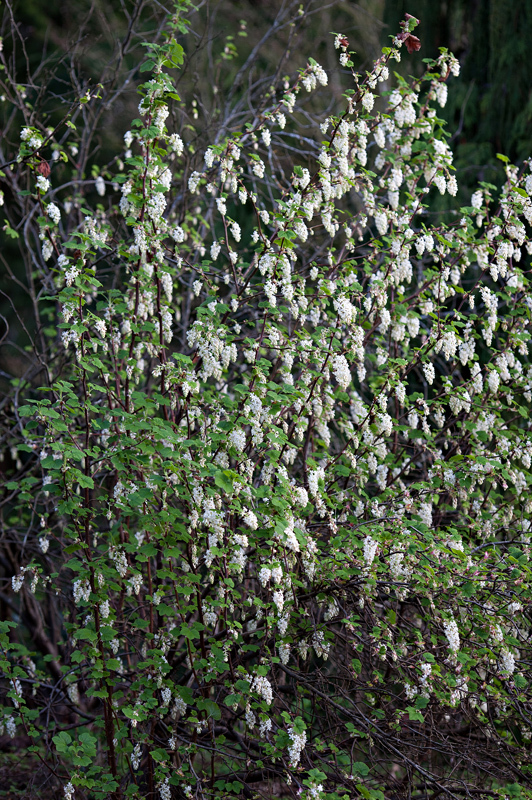 The photo was taken by Phil Van Soelen, of California Flora Nursery, and introduces an article by Paul Lee Cannon on the western species and cultivars of Ribes that are available for gardeners on the West Coast–and beyond. Eric, not in this instance.